Believe it or not, I’m a huge believer that sometimes the simplest dishes are the best. A simple pizza, good chicken broth, and heck even well-cooked rice can be some of the best eats I know. That said, it’s very apparent to me that sometimes even those simple dishes can take longer than most people have. Especially on week nights, most people are looking for something quick, filling, and flavorful. Couple that with the cold weather and all signs point to pasta carbonara for me. It’s one of my favorite ways to prepare pasta. 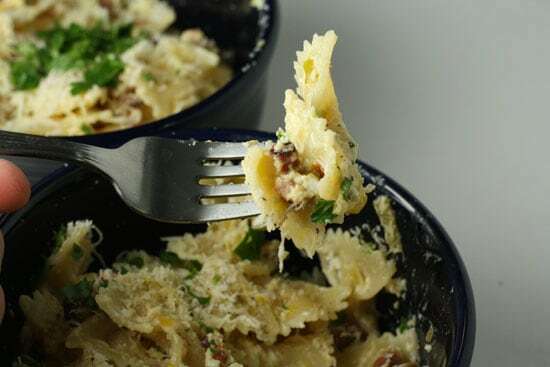 Instead of a tomato or cream sauce, pasta carbonara is basically just eggs that are stirred into cooked pasta. 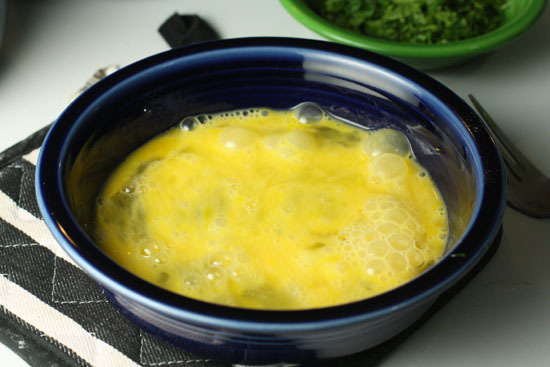 The eggs cook slowly and make a kind of creamy and delicious sauce. 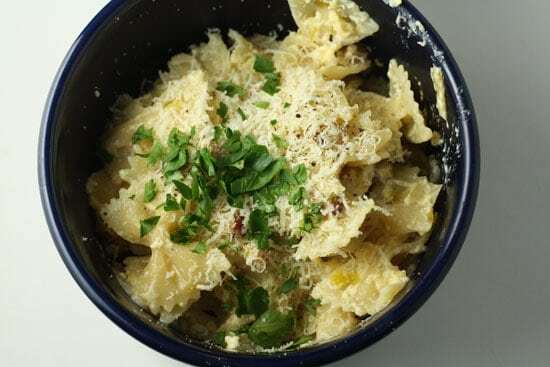 To change up the normal, I used bowtie pasta for this and added some crispy bacon and sauteed leeks for even more flavor. There’s really nothing fancy about this dish and you could even strip away a lot of the ingredients I use if you wanted to simplify it even more. You could ditch the bacon and leeks and have a much more traditional pasta. A little cheese grated on top with maybe some chopped parsley and you’d still be in good shape. A quick and simple carbonara with bacon, leeks, and bowtie pasta. 1) Get water boiling for pasta. Salt it with 1 TBSP. salt per gallon of water. Cook pasta according to package. 2) Dice bacon and add to pan over medium heat. Cook until it’s nice and crispy. 3) Dice leek making sure to rinse well to remove dirt. 4) Prep other ingredients for the dish. 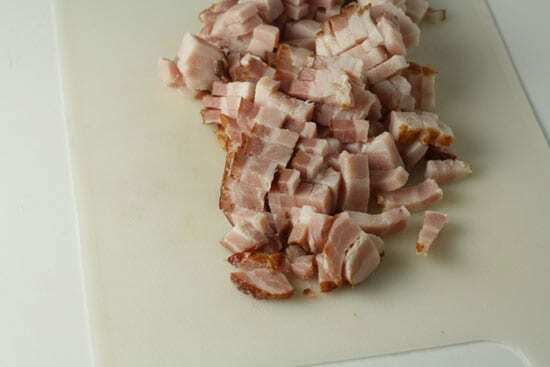 5) Remove crispy bacon from pan. 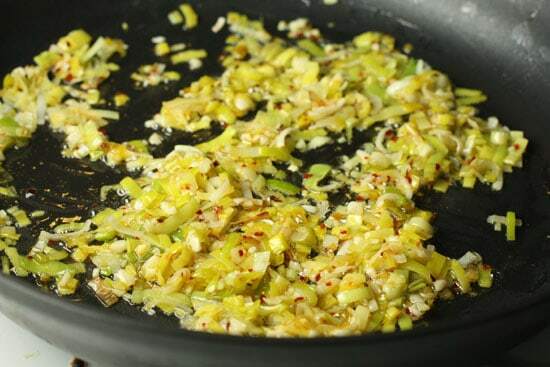 Add leeks to pan with a drizzle of olive oil if the pan is very dry. Cook for a minute or two and add red pepper flakes and garlic. Cook for a minute to soften the veggies. 6) Add bacon back to pan. Drain pasta and stir cooked pasta in with leek and bacon mixture. 7) Drizzle in egg mixture and stir like crazy. Kill the heat on the pan. The heat from the pan and pasta should cook the eggs and thicken the dish. 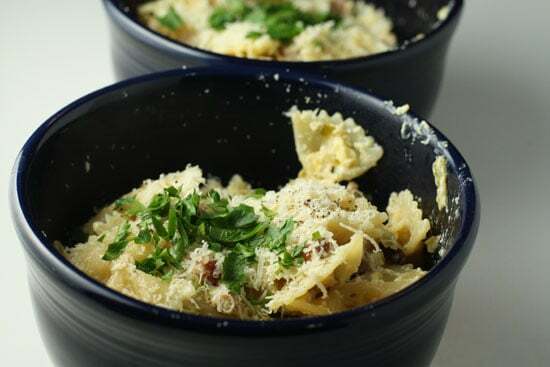 8) Season with salt and pepper and serve with grated parmesan cheese and chopped parsley. The good news about this dish is that it takes literally 30 minutes to make, start to finish. To start, get a large pot of salted water boiling for the pasta. Bowtie pasta takes a bit longer to cook than spaghetti, so definitely get your water going at least. I like to use a little bacon for this dish and trust me a little goes a long way. Just dice it up into pieces. I used four thick strips for a pound of pasta so it’s really not all that much once it’s in the finished dish. Throw that into a pan and let it start to brown. The crispier the better in my opinion! Meanwhile, dice up a leek. 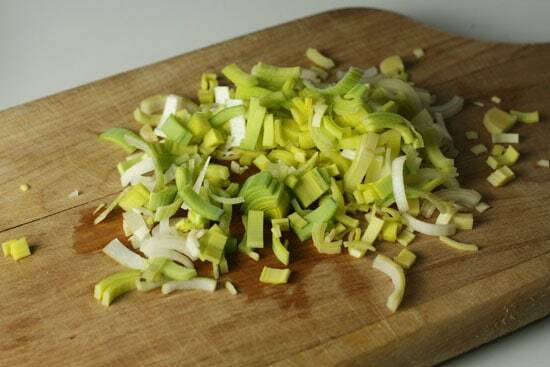 The important thing to remember about leeks is that they tend to have a lot of dirt in between their layers so chop it in half horizontally and wash it under cold water. You can kind of peel apart the layers a bit to get it nice and clean. Then dice it up! I like to get everything ready for this recipe because it all comes together really quickly. These are all the things you’ll need. The chopped parsley is just for finishing the dish. When your bacon is crispy, move it onto a paper towel and then add your leeks to the rendered bacon fat. Oh yea… that’s flavor. You shouldn’t need any additional oil, but if it looks really dry, add a tablespoon of olive oil. I also added a pinch of red pepper flakes just to give it some heat. After the leeks cook for a minute or two, add your garlic also. You don’t want to completely caramelize these guys, just cook them down a bit until they’re soft. Meanwhile, make sure to have your eggs ready – just lightly beat them! 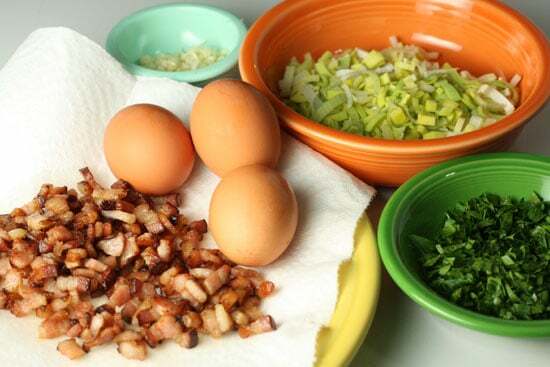 Once your leeks are cooked, add your bacon back to that pan and stir it all together. When your pasta is done, drain it and then add the pasta back to the pan over low heat. Now for the fun part. Add your leek/bacon mixture to the pasta and mix everything together. Then drizzle in your beaten eggs and stir like a banshee! 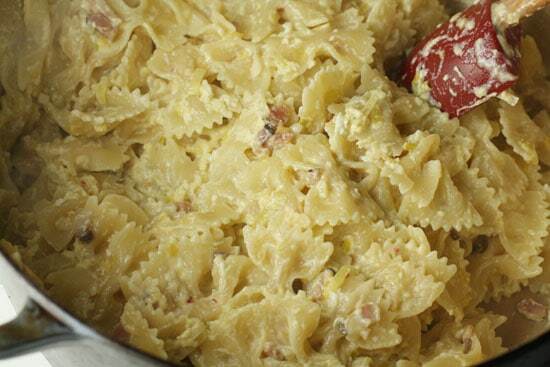 Don’t let the eggs clump together too much or you’ll end up with scrambled egg pasta – not as tasty. The key is to make sure you work quickly after you drain the pasta so it’s still very hot. After you add in all your eggs, stir it for a minute to make sure the eggs are cooked all the way and then taste for salt and pepper. The bacon will add some saltiness, but you’ll probably want to hit it with a good pinch of both. Serve it right away! It’s best with grated Parm cheese and chopped parsley. The dish is actually a lot lighter than it looks. Remember that there is no cream or anything in the dish (although you could add some if you wanted), that’s just from the eggs. This is such a great dish and one that I think anyone can master. It’s perfect for a cold winter night when you don’t have a lot of time. Give it a shot and get on the carbonara train. You are right! Something like a psychic connection here. I love the leeks you added to the dish for that extra dimension. I also love how you left in the bacon fat. That's right, don't be afraid of real food! One of my favorite (unhealthy) pasta dishes!!! Try with chorizo and manchego for the version I ended up making while in Spain, where oddly I learned how to make Carbonara. Gives it an AWESOME color and spiciness. Sounds delicious or should I say… delicioso. yum! my stomach is growling already! Can't wait to try this!